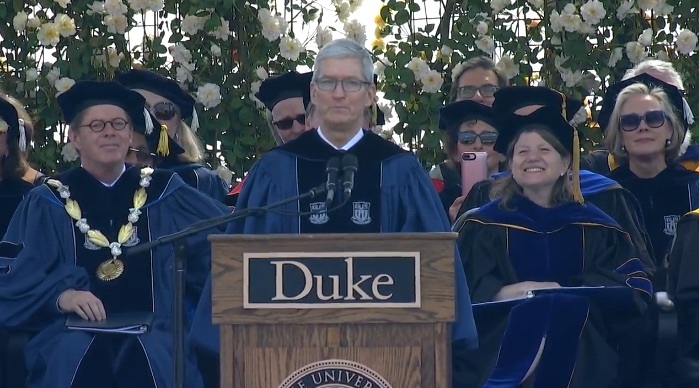 Apple CEO Tim Cook on Sunday returned to his alma mater, Duke University to deliver the 2018 commencement address. He talked about his mentor, the late Steve Jobs, told the students to “think different,” not to accept the status quo, and to leave the world better than they found it. Cook left to a standing ovation. I didn’t always see life as clearly as I do today. But I’ve learned that the greatest challenge of life is knowing when to break with conventional wisdom. Don’t just accept the world you inherit today. Don’t just accept the status quo. No big challenge has ever been solved, and no lasting improvement has ever been achieved, unless people dare to try something different. Dare to think different. Steve’s vision was that great ideas come from a restless refusal to accept things as they are, and those principles still guide us at Apple today. We reject the notion that global warming is inevitable—that’s why we run Apple on 100 percent renewable energy. We reject the excuse that getting the most out of technology means trading away your right to privacy. So we choose a different path: collecting as little of your data as possible, and being thoughtful and respectful when it’s in our care. Cook’s has delivered addresses at a numerous other universities in recent years, including at Auburn University in 2010, George Washington University in 2015, and the Massachusetts Institute of Technology last year. Cook is a 1988 graduate of Duke’s Fuqua School of Business. he is a member of the university’s Board of Trustees.